What are the top landmarks in Bordeaux? Place de la Bourse is a well-known landmark worth seeing in Bordeaux. Wander around the gardens in this relaxing area or simply enjoy its wineries. Place de la Victoire is a well-known landmark worth seeing in Bordeaux. Wander around the gardens in this relaxing area or simply enjoy its wineries. You can spend an afternoon studying the exhibits at The City of Wine during your trip to Bordeaux. Wander around the gardens in this relaxing area or simply enjoy its wineries. Bordeaux Historic Center is a welcoming, walkable neighbourhood. Bordeaux City Centre is a welcoming neighbourhood. Many visitors come for its beautiful outdoor setting, especially the gardens. Quartier du Lac is a neighbourhood that welcomes all visitors. 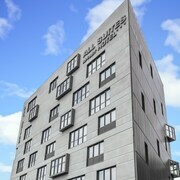 The Chartrons neighbourhood welcomes visitors, with its convenient options for restaurants. Broaden your horizons with some local shopping. An historic neighbourhood, Bordeaux Golden Triangle offers a variety of options for restaurants. The neighbourhood has many appealing features, among them its architecture. Broaden your horizons with some local shopping. Bordeaux-Lac is a welcoming neighbourhood. For a city break where food and drink play a big role, Bordeaux in south-west France is hard to beat. Surrounded by vineyards, it’s often described as the wine capital of the world, so it’s perfect if you want daily wine tastings to be part of your holiday. Bordeaux has also got a reputation as a gastronomic centre, with an eating scene that takes in traditional French dishes, inventive modern cuisine and tempting street food. Don’t worry too much about overindulging though, as you’ll also be spending plenty of time on your feet exploring the historic streets of this attractive city, the largest urban UNESCO World Heritage Site. Grand mansions built by 18th-century wine merchants and imposing Gothic cathedrals sit next to dazzling modern constructions by some of the world’s top architects. There’s also the mighty River Garonne. Weaving lazily through the city’s heart, it’s the perfect spot for relaxing waterside strolls. If you’re looking for a good central location to start your explorations, pick a hotel near the Place de Quinconces. Set on the banks of the Garonne, it’s the largest square in France and conveniently located close to many of Bordeaux’s attractions and landmarks, many of which are in easy walking distance of each other. 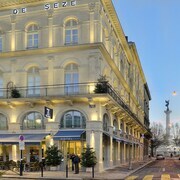 To experience Bordeaux at its most elegant, choose a hotel in Bordeaux’s neoclassical Golden Triangle (Triangle d’Or). Bounded on three sides by the Cours Clémenceau, Cours de l’Intendance and Allées de Tourny, it’s easy to see why this smart district of honey-coloured stone buildings got its name. It’s a great area for shopping, with many independent boutiques and designer outlets on little streets radiating out from the circular Centre Commercial les Grands Hommes shopping centre at the triangle’s heart. If you need to take a break from any retail therapy, you’ll also find plenty of bars and cafés where you can enjoy a little refreshment while watching the world go by. If you are visiting on a budget, you’ll find a good range of two-star hotels in Bordeaux. Though some are located on the outskirts of town, there are also quite a few close to the historic centre. Just south of the Golden Triangle are comfortable and affordable options such as the Acanthe Hotel, the funky Mama Shelter Bordeaux and the more traditional Hotel La Porte Dijeaux, keeping you close to the action without breaking the bank. 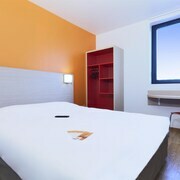 If you plan on arriving by train, you’ll also find a good range of affordable accommodation close to Gare Bordeaux Saint-Jean, the city’s main railway station. This busy transport hub is a great way to reach Bordeaux or to explore other parts of France, with direct links to destinations such as Paris and Strasbourg. To see more of the city’s heritage, choose a hotel in the historic centre of Bordeaux, which extends from Place de la Victoire in the north to Place de la Comédie in the south. The latter is where you’ll find the Grand Theatre, a stunning building with a façade supported by 12 huge columns. The Place de la Bourse in the district of Saint-Pierre is a grand square that showcases Bordeaux’s wealth. This elegant 18th-century square faces the river and is home to the Fontaine des Trois Grâces. It’s also where you’ll find the National Customs Museum which, despite sounding a little dry, is actually a fascinating insight into the oldest branch of France’s civil service. Highlights include displays of unusual items that have been confiscated over the centuries, plus works of art from Monet and Picasso. If you’d prefer to stay outside the city, there are plenty of options in neighbouring towns and suburbs such as Bègles, Bouillac, Gradignan, Pessac and Talence. 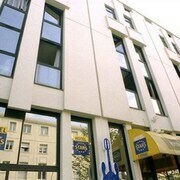 A particularly popular option is to choose accommodation in Mérignac. Just a 20-minute drive from central Bordeaux, it’s conveniently located close to the city’s airport. If you’ve got a taste for the wines of Bordeaux, why not sample some other local tipples? Book accommodation in Bergerac to the east of Bordeaux to explore another famous wine region, or head north and stay in a hotel in Cognac where you can try something a little stronger. Explore Bordeaux with Expedia's Travel Guides to find the best flights, cars, holiday packages and more!